Hey, you there. Gal or guy who loves Final Fantasy but has spent your entire life avoiding the MMOs because they’re, well, MMOs. Here’s some advice: Go play Final Fantasy XIV. Most importantly for JRPG fans, you can play it all by yourself. You’ll have to join a party for the dungeons and bosses, sure, but FFXIV will match you up with random people pretty seamlessly. From what I’ve seen so far, it’s easy to stay anti-social and play through the game at your own pace, exploring and questing in whatever order you’d like. The world of Eorzea is huge and constantly rewarding; once you get past the rather atrocious user interface (at least on PS4), it’s a treat to wander around there. Yet. Yet! Ever since FFXIV got rebooted as A Realm Reborn and people like Fahey wouldn’t stop raving about it, I’ve always been tempted to dig into the fourteenth Final Fantasy. Earlier this year, I did just that, leveling up a Thaumaturge (aka black mage) and Gladiator (aka paladin) before other games stole my attention. Then, while on vacation this week, I jumped back in, and all of a sudden I’m hooked again. I love the story, the music, the visuals. I love meeting all the quirky new characters and fighting giant summoned bosses like Ifrit. I love riding goddamned chocobos. 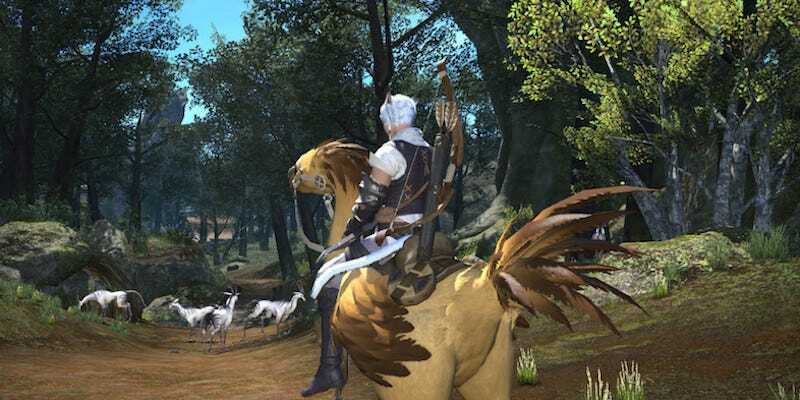 Perhaps the biggest issue with Final Fantasy XIV is that, like World of Warcraft and many other big MMOs, you’ll need a subscription to play it. You’ll get the first 30 days for free; after that, you’ll have to pull out the credit card and commit to a subscription, which is a real bummer because it gives you this looming feeling that you have to play FFXIV at all times or else you’re wasting your money. Still, if you like Final Fantasy but have never cared to play the MMOs, take my word for it: Even as a single-player game, FFXIV is great. Also, you can play Triple Triad with strangers and NPCs. If that isn’t enough to pique your interest, then, well, you’re not a Final Fantasy fan.